Johnson was part of the Liverpool side that won the League Cup in 2012. 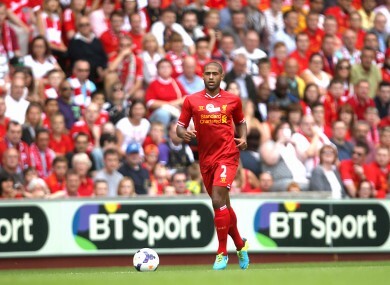 GLEN JOHNSON IS among five players to be released by Liverpool, the club have confirmed. The 30-year-old full-back, who the Reds signed from Portsmouth for £17.5million in 2009, had been widely expected to leave Anfield this summer. The England international has produced some disappointing displays in recent times, and has often been partially blamed for Liverpool’s all-too-regular defensive mishaps. Steven Gerrard, whose impending move to LA Galaxy was confirmed in January, has now also been officially released by Brendan Rodgers’ side, as have goalkeeper Brad Jones and youngsters Jordan Lussey and Marc Pelosi. Email “Glen Johnson among five players released by Liverpool”. Feedback on “Glen Johnson among five players released by Liverpool”.